An Ohio son will bring his charges to the banks of the Olentangy River on September 9th. Bob Stoops lost to his home-state team last year, but vies for a different result this season. To get the victory, Stoops will rely on new players at key positions. Gone are running backs Joe Mixon and Samaje Perine, wide receiver Dede Westbrook and linebacker Jordan Evans. Mixon was the Sooners' leading rusher in 2016 and all Perine did was finish as Oklahoma's all-time leading rusher. Westbrook was the team's leading receiver and Evans led Oklahoma in tackles and interceptions. That is a lot of talent and experience to replace. Possible players to step-up at those positions are running back Abdul Adams, tight end Mark Andrews and linebacker Emmanuel Beal of Reynoldsburg. 2017 4★ running back Trey Sermon of Georgia could also be in the mix. Two key players returning for Stoops are quarterback Baker Mayfield and linebacker Ogbonnia Okoronkwo. Since the close of the 2016 season, Mayfield had some off the field issues. Oklahoma fans are hoping the celebrated quarterback will be able to dodge Ohio State defenders better than he did middle-aged police officers. The 6'1" 242 pound Okoronkwo led OU with 9.0 sacks last year. Ohio State's new-look offensive line will have to be aware of where the talented linebacker is positioned before every snap. 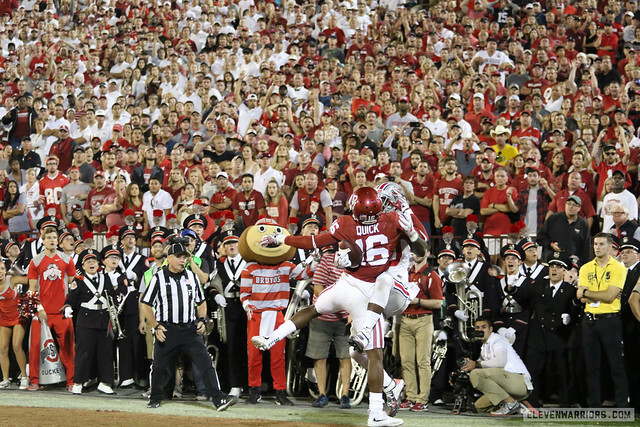 Ohio State is 2–1 all-time against against Oklahoma, but has never defeated the Sooners in Ohio Stadium. This is the second time the Buckeyes have faced OU in Week 2. Over the years, OSU is 3–1 when playing a current member of the Big 12 as the second opponent of the season. Ohio State played Oklahoma, Urban Meyer's team traveled to Norman and defeated spanked the Sooners 45-24 in front of a national audience during prime time. The Buckeyes played OU in Columbus was 1977. No. 4 Ohio State lost to No. 3 Oklahoma 28-29. A late field goal gave Barry Switzer's team a dramatic victory. These teams played in Ohio Stadium, Jimmy Carter was president. Ohio State played on September 9, was 2006. The No. 1 Buckeyes traveled to Austin and beat No. 2 Texas 24-7 in Darrell K. Royal-Texas Stadium. The Buckeyes played their second game on this date, they defeated Texas in the game mentioned above. Ohio State lost the second game of the season was 2014. Unranked Virginia Tech shocked the eighth-ranked Scarlet and Gray 35-21 in Columbus. The loss stung, but the season turned out to be decent. OSU played a Big 12 opponent was the Texas game in 2006. The Buckeyes had a Week 2 game go to overtime was never. Coaching Status: Bob Stoops (190–48) is in his 19th season. Bob Stoops needs to replace his leading rusher, leading receiver and leading tackler. Joe Mixon led the Sooners with 1,274 rushing yards. Samaje Perine led the team with 12 rushing touchdowns. Last year, WR Dede Westbrook had 1,524 receiving yards and 17 touchdowns. Not only did Jordan Evans lead Oklahoma with 98 tackles, but he also had a team-high four interceptions. This is the third time the Buckeyes have played on September 9th. No. 16 Ohio State defeated Arizona 27-17 in Tuscon in the program's first game played on this date (2000). The Buckeyes are 2–0 when ranked in the Top 20 on September 9th. Ohio State is 1–0 against ranked opponents on the ninth of September (Texas, 2006). Surprisingly, this will be the program's first home game on this date. Ohio State is 94–29–4 in the second game of the season and is 73–15–2 when the game is played in Columbus. Between 1972 and 2016, the Buckeyes have only lost three home games during Week 2. The losses were to Virginia Tech (2014), No. 3 USC (2009) and No. 2 Texas (2005). The Buckeyes are 19–5–1 against current members of the Big 12. Since 2005, Ohio State is 2–2 against when facing a Big 12 opponent. Between 1978 and 2004, OSU had a record of 10–0 against current members of the Big 12. The first Week 2 game played against a Big 12 / Big 8 opponent was against Colorado on September 25, 1971. Woody Hayes and the Buckeyes lost to Eddie Crowder's Colorado Buffaloes 20-14 in Ohio Stadium.